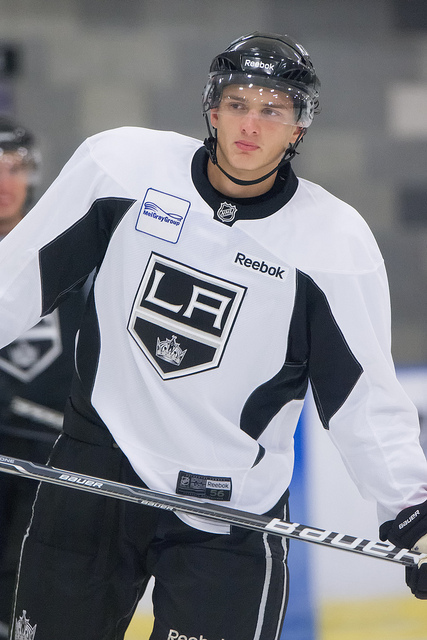 Nikolai Prokhorkin had a busy summer as he first announced to have been signed by the Los Angeles Kings to an entry-level deal, then he instead signed a new one-year contract with CSKA Moscow of the KHL. In this interview originally appearing on SovSport, Nikolai Prokhorkin talked about his chances with the Kings, his new contract with CSKA Moscow, and his adventures in Munich. – We agreed on everything with CSKA. Now all the problems are history. Why we signed a one-year deal with CSKA and not a three-year one? Finances weren’t satisying. Yes. Los Angeles really wanted to sign me, they even sent their scouts in Russia, but they didn’t give me any guarantee that I’d play in the NHL, they can still demote me down. – Do you really think you can get a spot in the lineup of the current Stanley Cup champions? – And what’s the problem? When Los Angeles won the Stanley Cup in 2012, the next year they called up two guys of my same age, with whom I played myself. – There is a certain abudance of good centers there. – Well, it happens that sometimes a player gets from the first to the fourth line. But Kopitar and Carter are two true stars and it will be hard to fight with them for a spot in the team. – According to the rumors you asked CSKA a 2 million dollars contract. Ten times what you earned before. Not bad. – Yes, it’s a big jump. But there are many players who get a lot of money. I strive to get to their level. I think that we had a good deal with CSKA. My goal is having a season not worse than 2013-14. – And how much would you have to pay if you wanted to buy out your contract with CSKA? – Last year I earned six million rubles (about 170.000 dollars). According to the rules I should have paid two thirds of this amount, so four millions (about 115.000 dollars). – Aren’t you worried about not progressing spending too much time in Russia? – It’s a double-edged sword. Alexei Emelin left Russia when he was 24. This summer Kontiola and Lethera left at 27. I’m just 20. – What are the differences between former CSKA coach [former NHL coach John] Torchetti and the current one, [Former Boston Bruin Dmitry] Kvartalnov? – Torchetti was a true North American coach, and you had to be ready before the start of the tranining camp. Under Kvartalnov the practices are much harder. – With what spirit did you follow the World Championship in Minsk, Belarus? – All is ok, even if I wasn’t invited. During the preparation games I didn’t show the game the coaches expected from me. I watched just a couple of games. I don’t like watching hockey on TV. Too much advertising, too many pauses. – You’re a center, but in the national team they made you playing on the wing. Was it hard? – It’s a whole another game. Wingers try to break away from the defenders, but I don’t have such skills. I try to distribute the puck to my line mates, creating rushes, trying to get to the puck on a return pass or a rebound. – How did you spend the summer? – Me and my family went to Turkey for a couple of weeks. Then I started practicing for the new season in Moscow. – What will be the first thing you’ll buy with your first big salary? – I would love to buy a car. I don’t have one yet. I’m not an expert of cars. I liked a Japanese one… I learned to drive, got my license in May. I was driven through the city and the police stopped me. And I forgot my documents at home. The policeman let me go, but asked for some gifts, and I gave him CSKA-branded stick and puck. – Did you buy a flat in Moscow? – I didn’t have a chance so far. Maybe this season, if all will go well, I’ll start a mortgage. – In you Instagram account there is a picture of you wearing a Bayern Munich jersey. – Yes, that was when we were there with the national team. Me and [Evgeny] Medvedev were walking down the city and we got into a sport goods store. So we bought those jerseys and wore them. Later that night, we went to dinner. And at the restaurant a man steps up and says: “Guys, do you play in Bayern Munich’s second team?” They thought we were football players… I enjoy watching football, but not Russian one, it’s boring. – Are you friend with some national football team player? – No, I have many friends among boxers. For example, Sergey Kovalev. He’s from Chelyabinsk too and we are friends since the childhood. My uncle was a boxer as well, same year of birth as Kovalev. I used to hang out a lot with them.